This six-week program for strength, balance, flexibility and pain relief is co-authored with Kimberly Carson. Have a minute? In sixty seconds—or even less—you can practice yoga and gain significant and lasting benefits. Easy, effective practices for releasing tension and relieving pain. Pioneering research shows that simple movement offers profound benefit and can help relieve a wide range of diseases. 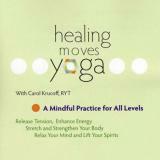 This DVD combines the best of modern, evidence-based medicine with the ancient wisdom of yoga. Whether you’re new to yoga or a seasoned practitioner, this guided audio practice brings the deeply nourishing experience of Carol’s popular yoga classes into your own home. This practical resource delivers a critical and balanced assessment of the evidence for complementary alternative medicine. A unique worship experience that brings together body, mind, and spirit. Let Carol guide you through gentle yoga practices by downloading these audio files onto your computer and/or smartphone. Enliven your energies with this invigorating, 47-minute practice. Wake up your body and mind with this 46-minute practice to help you prepare for your day. Give your body a break from sitting with this 20 minute standing practice that will help you build strength and improve your posture. In just 30 minutes you can experience a complete practice designed to stretch and strengthen you body, ease your mind, and lift your spirits. Boost your balance with this 20 minute practice designed to strengthen your legs and core and enhance the neurological pathways that help keep you upright. Energize your body and mind with this 8-minute yoga break that focuses on building upper body strength and boosting balance. Stretch out your neck, arms, shoulders and upper back with this 18-minute practice done sitting in your chair. Stretch out your legs and find ease in your hips with this 12-minute practice. Try it first thing in the morning to relieve stiffness – feel free to practice in the comfort of your own bed. Designed to take all the body’s major joints through their full range of motion, this 24-minute practice includes the centering breath, gentle postures, and relaxation.